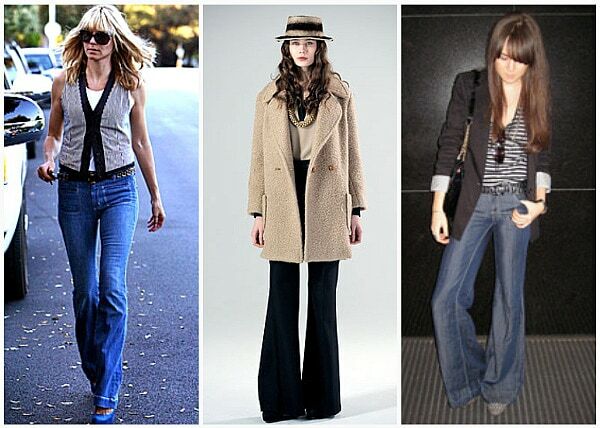 The ’70s are back in a big way, especially in the denim world. If you don’t believe me, check out MK and Ashley’s new denim collection TEXTILE Elizabeth and James (Victoria Beckham is also a flare fan). Skinnies have become the norm (and will probably stay that way), but if you are looking for an alternative to your favorite straight-legged bottoms, this Fashion Challenge is the one for you. Just try it! The best part about this challenge? Flared bottoms are universally flattering: Anyone can pull off this trend and look amazing doing it. This is my take on Andy’s (from Style Scrapbook) look in Picture 3. I chose a striped bodysuit (on sale!) for a super sleek effect when worn with the high-waisted McQ jeans. Wedges keep things summery, but if it gets cool, a slouchy blazer pulls everything together. A chain-link bib necklace adds interest a la Ms. Palermo. What are your thoughts on flared bottoms? Any thoughts on TEXTILE Elizabeth and James (it got a few poor reviews, but I really like the collection–so does Kristin Cavallari)? Already work this trend? 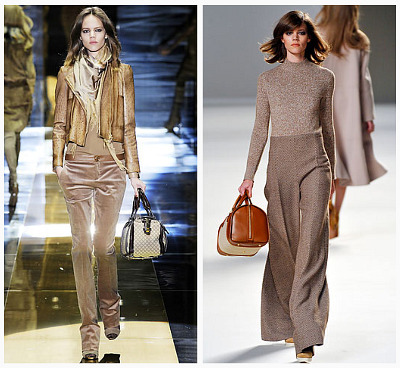 Send us pictures of you in your flared pants and we’ll feature them here! * As always, we are open to suggestions for future fashion challenges and we’d love to hear from you!